Blog › Information › Come see us at the Malvern Flea and Collectors Fair Bank Monday 26th May! Have you heard of the Flea and Collectors Fair at the Malvern Three Counties Showground...? Meet us there, weather permitting, gates open from 8:30am. If you're a fan of our metal wall art, resin wall art, garden accessories and more, all displayed on our Website, why not see them in person! Are you looking for that perfect piece to complete your home, garden or office? All our latest collections will be displayed on our stand, with a few particular classic and contemporary favourites among our art lovers. Our collection will be sure to brighten up your decor both indoors and outdoors, with some pieces adding a humorous element, such as our popular wooden signs. If you would like us to bring a certain art piece along to the show, which you have seen on our Website, simply contact us today and let us know. Perhaps you have NEW collection ideas in mind for us, which are always welcome, the location postcode is WR13 6NW. 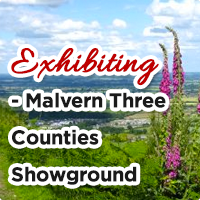 Hurry and buy tickets today before they run out....you'll have a great day out at Malvern!